Join us for holiday festivities at Terhune Orchards! In the wine tasting room, try our award-winning wines and warm up with a cup of our hot mulled wine. Sample our delicious Gift Basket “ingredients”: homemade baked goods, apple butter and more. On Sunday, enjoy live music from 1pm-4pm. During this Holiday Wine Trail Weekend, make a day of visiting New Jersey wineries on the Wine Trail. 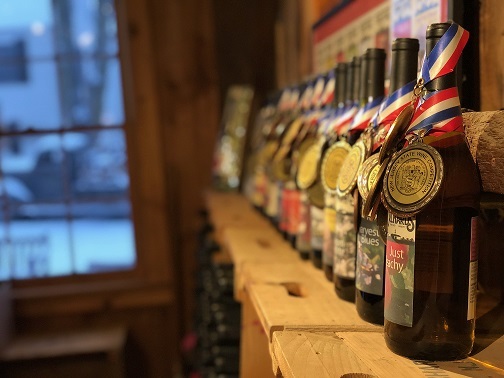 If you are participating in the Garden State Wine Growers Association Wine Trail weekend, receive a wreath and ornament at the first winery you visit, and then collect an ornament at each winery you visit afterwards. Terhune Orchards has special apple seed ornaments for your collection. Enjoy fun for the whole family with wagon rides and a visit to our barnyard of animals. While you’re here, get a jump start on your holiday shopping. Pick out the perfect Christmas tree and wreath, and choose from our unique selection of gift baskets overflowing with Terhune Orchards’ own fruit, baked goods, and even wine — perfect for anyone on your list!